PAC was crowded on Friday night for housing bank forum. At a public forum Friday evening, Islanders aired questions, concerns and support for a proposed housing bank on Martha’s Vineyard. 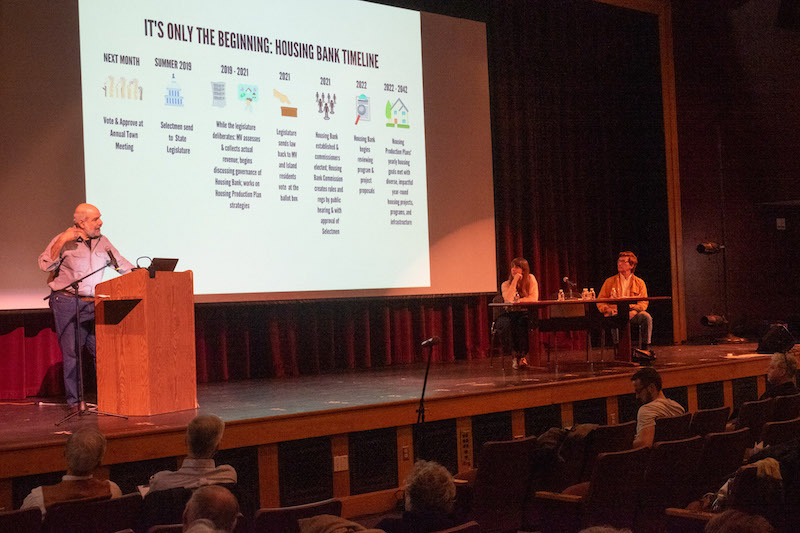 Proponents of the housing bank held the forum to discuss the details of two warrant articles they have successfully petitioned to go before voters on town meeting floor this season. The first warrant article would establish the housing bank as an Island-wide entity, similar in structure to the Martha’s Vineyard Land Bank, that would work with towns to construct and support year-round housing on the Vineyard. The second warrant article asks voters to allocate 50 per cent of the revenue from the recently passed short-term rental tax to fund the housing bank. 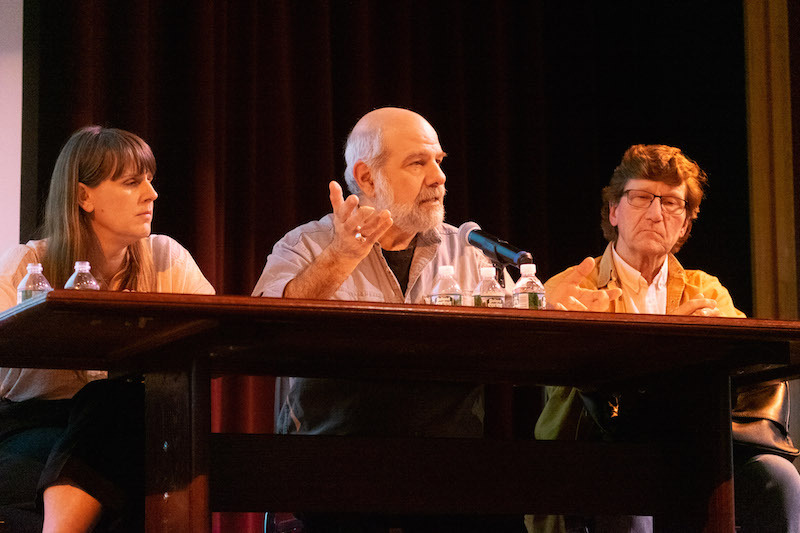 Although the two warrant articles have received pushback from down-Island selectmen who would prefer to use the new tax revenue to help balance already cash-strapped budgets, the housing bank listed hundreds of supporters at the forum on Friday and has galvanized a broader discussion about the Island’s housing crisis. That discussion continued on Friday, as state representative Dylan Ferdandes told audience members that because they live in a “profoundly unaffordable district” state legislators would be open to creative ways to expand housing opportunities — as long as it passed at town meeting. Housing bank representatives then spoke about the need for year-round housing on the Island and the history of past attempts to establish a housing bank. Doug Ruskin, vice president of Island Housing Trust, explained how the state-wide real estate lobby blocked a 2005 housing bank proposal that would have received funding from real estate transactions. But some Islanders who spoke at the forum on Friday felt differently. West Tisbury resident Abigail Higgins feared that efforts to house year-round residents would lead to unmitigated growth on the Island. Aquinnah resident and housing bank advocate Peter Temple responded by saying that while elderly populations on the Island are set to grow over the next 10 years, the youth population will decline, partly because housing costs are prohibitive for young working professionals. Others who spoke at the meeting asked more logistical questions about the nuts and bolts of the housing bank and its enabling legislation. Dukes County register of deeds Paulo DeOliveira wondered whether towns would have the chance to alter the percentage of the short-term rental tax that would go to the housing bank once revenue estimates from the tax became clearer. Mr. Ruskin said that both warrant articles are for home rule petitions, meaning they would have to get approved by the state legislature and then come back to Island towns for a ballot vote in a potentially two-year-long process. Paddy Moore, chairman of Healthy Aging Martha’s Vineyard, said it was crucial to educate Islanders about the warrant articles because of the immediacy of the housing crisis. Mr. Ruskin said furthering the conversation was paramount. “The most important part of this is a robust discussion tonight and at town meeting,” Mr. Ruskin said. The MV Housing Bank initiative is an important initiative to support at town meeting and I encourage everyone reading to learn more about it and to vote to pass it at their town meetings. One of the main reasons may be to help provide housing for many generational families on this island who are finding it impossible to maintain continuity here. We need housing for nurses, teachers, police and firefighters, the people who staff our banks and supermarkets like Cronig’s abd MV Grocer and all our stores. It is not right to ask a third-grade teacher to teach island children on a full-time basis to go back-and-forth each day. That is wrong. It is just one of many examples, like the multi-generational families, examples that this initiative can improve. Long-time seniors can positively be affected as well with housing for senior service providers and also downsizing homes. Don’t sleep on this one, Martha’s Vineyard. we have plenty of houses on island. We need to increase wages of those you mention so that they can purchase those houses. Yes, increase wages! Many workers leave the Island due to lack of housing but also due to low wages. For example, in 1990 I was offered $18/hr, and recently, I was offered a similar job for $14/hr. For local workers, the cost of rent went up and wages went down. Some Island workers decided to jump on the boat to pursue better living conditions and higher pay; godspeed to them, I say, I wish them well. MA will initiate a $15/hr minimum wage in about 2 years. It makes sense that the standard wage on MV be higher than state minimum, the way it used to be. Perhaps another tradition lost. How is it “not right” for a teacher to commute but apparently acceptable for others? If school age children can commute to Falmouth Academy I’m sure teachers can do the same in the opposite direction. Housing crisis? How about “non- high paying jobs” crisis. Here’s an idea- take 50% from each town and increase the salaries of all fire, police,emt,teachers, nurses and other “community necessary jobs” so they can afford to buy the houses that are already built and sitting empty half the year. We have plenty of houses. What we need is to increase wages. The answer to the housing problem is both simple and complex. On the simple side just change zoning to make it easier to allow for more building of accessory apartments, duplex apartments and so forth. On the complex side how to deal with increased infrastructure needs such as sewage, traffic and schools. Have you noticed how heavy (by island standards) the winter traffic of the last few years? Tax is not the answer. Plus, what housing advocates are doing is creating housing for the poorest while ignoring people with good paying mid income jobs from $50k to $100k for individuals and more for couples. There is nothing at all for them. Need proof? The MVC bought a house for their Executive Director because he makes more than $100k and couldn’t otherwise afford to live here. I will vote no to a housing bank tax and I encourage you to vote no as well. The housing bank doesn’t want 50% of the new short term rental tax, they want 50% of the existing hotel tax AND the new short term rental tax. This means existing property taxes for every home owner rich or poor will go up because the towns are already including the hotel tax income as part of their budgets. I hope all selectmen hold the line and just say no to the housing bank tax. Finally, where does it stop? If you build 100, 200 or even 500 houses/apartments today they will fill up. And then? The housing advocates will still say there is still not enough. It will never stop is the answer. William, Housing Bank MV's vision is to create and preserve year-round housing across all income levels, including financing for accessory dwelling units and infrastructure (sewage). For further information, please visit https://www.housingbankmv.org/what-will-it-create. I did look at that web page. Other than restaurant workers and artists - most people listed would make more money than currently would qualify for affordable housing as it exists today. I have direct knowledge with this dilemma. Then there is responsibility. Once you take someone out of the free market, it is unlikely that they will get back in. And now you have the responsibility to take care of them for the rest of their lives. Correct? Is that sustainable? Is that affordable for everyone else? Is there enough room on the Edgartown Vineyard Haven Road for two lanes on each side to accommodate the additional traffic? Did I mention that because this is a tax you can not limit this to islanders only? Anyone from anywhere can apply. Maybe a tunnel is a good idea after all. William, With the expanding tax revenue, the size of the pie will be bigger for the 6 towns. Forecasts indicate that the towns will come out way ahead even with 50% going to the Housing Bank. Please do the research before making uniformed comments. Demand will be met by individuals and families already here on MV. There is a waiting list. Please explain to me how you are increasing the tax base by filling supply with people already on MV? Furthermore, any new year round rentals will have a limited contribution to property taxes. All you are doing is disproportionately allocating tax revenue that could help reduce the property tax burden for all residents. Actually, neither one of us can actually know who is uninformed at this point because it has not happened yet. There are predictions, but, that is all they are. William, the towns and affordable housing community tries to address people with earnings that exceed 100 AMI, (area median income) sometimes even as high as 150%. What this looks like is 100% for a family of 2 = $74,160 and $92,700 for a family of 4. Even with those numbers we can't help them and using CPA funds limits what we can do because they are restricted to lower incomes. We need to think out of the box and be able to consider all our options which we can do IF we have money. Options like re-purposing existing larger homes into apartments, subsidizing summer rentals and turning them back into year-round homes, helping our aging population stay in their homes and so much more besides building. There is a lot of opportunity we cannot capture because the economics currently don't make sense but we can change that with an income stream. It is THE missing piece of the housing puzzle. How about making real estate prices more realistic and affordable to begin with. There are so many money pits for sale at extremely high prices that only the wealthy can afford and they come in, knock them down and build huge, seasonal homes, squeezing out the middle income workers. We need a MV sewer bank more than a housing bank. The largest article on last years Edg. warrant was seweage treatment upgrades. Half of Edg isnt hooked up. Its a huge problem. Id really back a sewer bank. I cant agree more. Let's clean up the mess we already have, before we add to the problem. Towns on the island can opt in to an additional 2.75 percent "tourist tax" that would be dedicated to sewer infrastructure. It requires a CWP, comprehensive wastewater plan. Talk to your town, OB, about adding that tax. Also, the housing bank may contribute to expansion of wastewater if related to providing housing. Raising wages would not work, not enough money in the towns. Now, it takes a salary of between $140k and $300k to buy the average house on the vineyard. A Housing Bank is a way of creating a permanent funding source for housing for various income levels. While houses sits empty, and are for seasonal use by their owners, we can not take those homes or force people to rent them. We can reuse, repurpose, and build some new units to accomplish the goal of creating more affordable housing. We can do nothing, and end up like Nantucket. The average house is around $2.2 million, and all our town workers, hospital workers, police, fire fighters, EMT's, trades people, restaurant workers, will arrive and leave by boat. That is the end result of doing nothing. Vote. This is a once in a generation opportunity to help solve what is becoming an intractable problem. It would certainly be helpful if the Local Banking institutions on Island got a more flexible approach in their underwriting formulas for local Mortgage applicants.. I don't mean "Countrywide robo signing " flexible but allowing certain criteria/metrics put into the mix of qualifying for an Island Property home mortgage. All the Local Banks love their deposits & are doing very well, so why not adapt an Island Mortgage model. I think that would make a dent in existing home ownership.. Can't rely on a quasi govt body to solve this .. Reality is that the local banking institutions are flexible in their approach in providing workable financing solutions. Programs for first time home buyers, those that work for non profits, etc. do exist. Call your local banker and have the conversation about your situation. You may be pleasantly surprised. Having a decent credit score is always a plus and something to aim for. At the same time, the prices of RE representing what is on the market today, do make it challenging. It all comes around to affordability and having the supply at various price points to make it all work. An island wide Housing Bank with a formalized governance process in place will help to solve for this. How do you propose the banks change their underwriting criteria? Logistical regression models have proven FICO, Income and DTI to be the most predictive attributes of credit quality. Lets not create another credit driven crisis because of slack underwriting. Mark, I am not proposing another Countrywide credit meltdown.. There are certain areas , IE. smaller down payments, slightly lower LTV levels to consider the hyper inflated Island RE values. especially on the "modest" inventory areas.. that could allow more buyers to qualify.. Maybe even increase a Borrowers FICO score to 690+. I imagine several local Lenders sell their mortgages in the aftermarket, but if they offered to service more of the Mortgages it just might make a dent.. I'm not in any way encouraging lax lending standards, just more customized for the Island moderate buyer pool.. Calm down.. I agree with Gina. Nice thinking outside the box. Also, for existing homeowners who struggle to keep their properties and pay taxes, this banking-oriented solution could benefit anyone with x percent of median income. The housing bank provides for greater benefit to those without homes who pass through its programs than it would to moderate income earners. Lots more people here than there were 30 and 50 years ago, and yet the taxes keep going up for those that pay them. Lots of land rich, cash poor folks out here. One way of helping the island be more affordable is to make it more efficient. New construction is amazingly expensive these days. IF a housing bank is created, let’s please take the time to design a multi-story community housing complex on land that is central, easy to develop, perhaps near the airport, in the state forest, etc. Take the legislators up on their offer to help by getting creative in ways that may not feel comfortable at first - but do smart things. We can. Maybe we need an affordable housing district to be carved out of State Forest land, or the Airport Business Park. Maybe we need a building that looks like a modern, yet island-style 3 story mall as a centerpiece of a large-scale, central development. Expand based on good planning. Figure out how many people we want to help in the next 50-100 years. Provide for sustainable funding, structure and appropriate supporting infrastructure that compliments existing needs and structure. Might we also invite all six towns to house their fire departments and police departments there as well, at prices they cant refuse? Seriously, we can make projections on population dynamics based on MVC and other readily available data. We have to respect our limits to do this well. Financial limits, physical limits, timelines, population. And, we can surely save via regionalizing other aspects of island life along with housing needs.